Fortunately, with new ultherapy technology like the Ulfit device, it’s possible for people to get the appearance they want without undergoing invasive surgical face lift procedures. Through ultrasound technology and the Ulfit device, you can can lift and tighten the problems areas of your face in an effective and safe way. The ultrasound technology used to perform a non-surgical facelift improves skin elasticity, stimulates collagen production and better circulation. You can say goodbye to wrinkles and sagging skin, and say hello to a more taut, toned, and rejuvenated face. You’ll notice firmer facial contours, less appearance of fine line, and reduced shadows and puffiness around your eyes. With almost no time at all, you will start to see results for just a fraction of the cost of a surgical facelift. After the non-surgical, safe procedure, you will be able to enjoy tighter, smoother skin that leaves you with a younger-looking face. 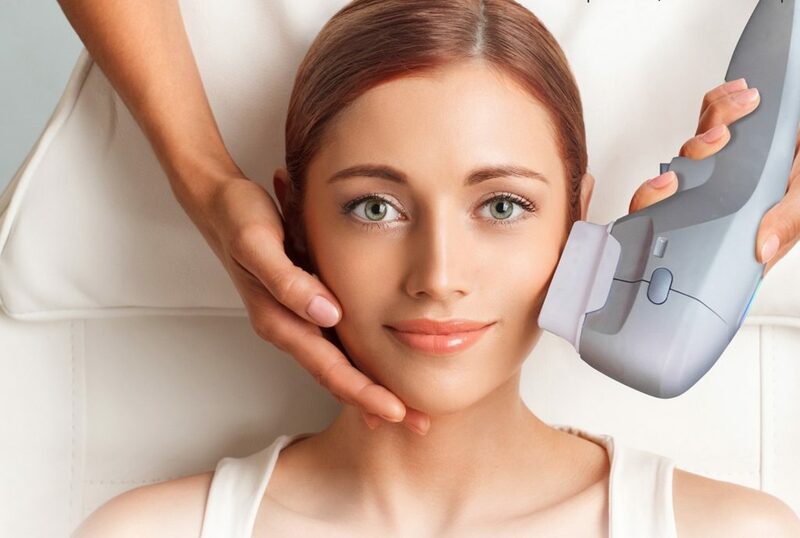 The ultrasound device Ulfit is the newest breakthrough for non-surgical face lifting and skin tightening technology. 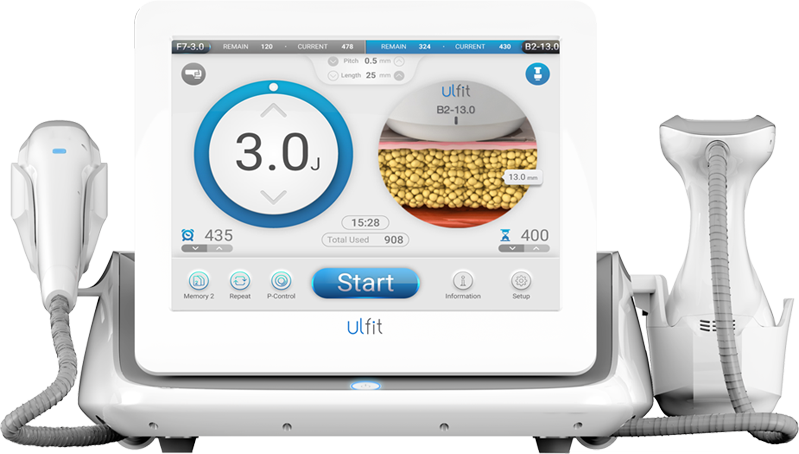 The Ulfit system delivers high-intensity focused ultrasound (HIFA) for skin and face lifting, and macro-focused circular ultrasound (MFCA) for body slimming. The Ulfit device successfully treats skin laxity on the face and delivers an effective solution for body contouring. Ulfit delivers focused ultrasound energy deep beneath the skin creating the optimal temperature for collagen regeneration and triggering a natural process called neocollagenesis, which produces new collagen. Ulfit relies on the body’s own regenerative response to smooth lines and wrinkles on the décolletage while gently and gradually lifting the skin above the eyebrow, under the chin, and on the neck. This natural process produces noticeable, long-lasting results without the use of fillers, creams or toxins. Three different facial cartridges are used to treat important layers of the skin: the 1.5mm and 3.0mm cartridges are used for the dermis layer whereas the 4.5mm cartridge is used for contracting and tightening the soft tissue of the superficial muscular aponeurotic system (SMAS). In the 6-12 weeks following treatment, the face becomes noticeably tighter and more contoured, with results lasting up to 12 months. In fact, Ulfit is known for speed and precision, and for delivering targeted, long-lasting results. If you are experiencing mild skin laxity (the face and neck look and feel less firm), Ulfit may be the best choice for non-surgical lifting. While Ulfit does not duplicate the results of a surgical facelift, it does addresses the same deep foundational layers of skin and is a great alternative for those not ready for surgery, or for post-surgical patients who wish to extend the results of cosmetic surgery. With non-surgical procedures, there is no significant pain, unlike with many surgical treatments. TreatmenWill ts often involve some type of numbing. Also unlike surgical treatments, there is very little recovery time (if any at all) with a non-surgical procedure like the Ulfit. Patients can usually go back to their normal life immediately, even back to work if needed the same day. Some patients may need 1 hour of downtime with some more extensive treatments. A surgical face-lift typically involves a much longer time for recovery. The Ulfit treatment takes often an hour or less. There is also no lengthy time of preparation before the treatment. With non-surgical treatments, almost all of the usual risks of surgery are avoided. The typical risks involved are limited to only minor swelling and bruising. Since non-surgical face lift treatments don’t involve the removal of skin and aren’t permanent, results can be adjusted as a patient’s face changes over time. During most non-surgical procedures, patients are asked to provide feedback and have control over the results. Since treatments are only done on small areas that need it, the effect of the procedure is limited to only the exact changes patients want to be made. The Ulfit device used for a non-surgical face lift can lift and tighten most problems areas of the face. This includes the forehead and periorbital, wrinkles, chin and double chin, eyebrows, cheek, v-line, and jowl line. Ultherapy treatments have the benefit of being just a fraction of the cost of their surgical counterparts. Treatments using the Ulfit device are designed to be more affordable and thus more accessible for the average person. Depending on the treatment area a typical treatment will cost between $330 – $1800. Book a free consultation to discuss treatment options and pricing. Yes. Ultrasound energy has been used safely in the medical field for more than 50 years, and Ulfit itself is TGA (Therapeutic Goods Administration) approved, meaning your can be sure it is regulated by Australia’s Department of Health and are safe to use. Most face and neck treatments last from 60-90 minutes and patients can resume normal activities immediately following the procedure. You may experience some redness during the treatment and for a few hours afterwards. Some clients experience temporary tingling, tenderness or minor swelling. If you want to learn how Ultherapy can help you enjoy a more youthful appearance book a free consultation today and we will work carefully with you to create a personalized treatment plan to leaving you looking great and feeling confident.